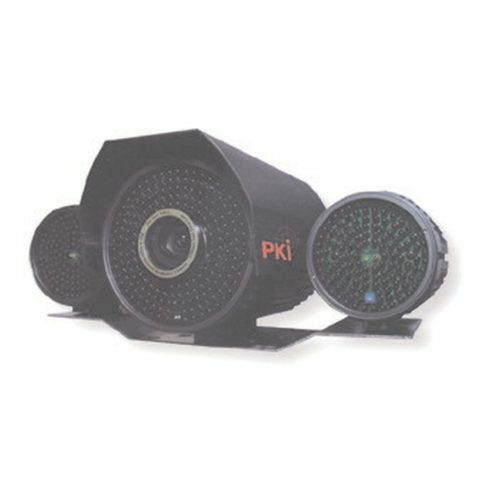 For a permanent video observation a clear colour picture in day time and an automatical change to B/W picture at night time, the PKI 5270 is what you need. As our duty is to deliver the best quality we have developed this complete camera which is a highly sophisticated day & night camera for use in every outdoor surrounding where video observations are necessary. By this, industrial areas, military camps, police stations for any other territories are protected by video monitoring for 24 hours a day. A clear colour picture is given in the daytime which automatically is changed to b/w picture at night time. 180 integrated infrared diodes illuminate the area of observation at night time or low-light conditions. The complete system comes in a weather-proof housing, including a cooling-fan for the control of heat from the IR-LED’s and a CDS sensor for the change from colour to b/w operation – depending on light conditions. The complete system optionally is available in PAL or NTSC version using a SONY Super HAD CCD camera with 410K pixels.